Epilepsy is a brain disorder in which a person has repeated seizures over time. Seizures are episodes of uncontrolled and abnormal firing of brain cells that may cause changes in attention or behavior. Epilepsy may be due to a medical condition or injury that affects the brain. Or, the cause may be unknown (idiopathic). Epileptic seizures usually begin between ages 5 and 20. There is also a higher chance of seizures in adults older than 60. But epileptic seizures can happen at any age. There may be a family history of seizures or epilepsy. Symptoms vary from person to person. Some people may have simple staring spells. Others have violent shaking and loss of alertness. The type of seizure depends on the part of the brain that is affected. Most of the time, the seizure is similar to the one before it. Some people with epilepsy have a strange sensation before each seizure. Sensations may be tingling, smelling an odor that is not actually there, or emotional changes. This is called an aura. The doctor will perform a physical exam. This will include a detailed look at the brain and nervous system. An EEG (electroencephalogram) will be done to check the electrical activity in the brain. People with epilepsy often have abnormal electrical activity seen on this test. 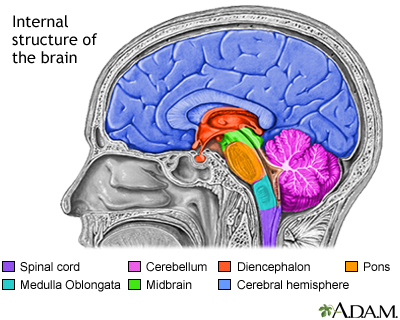 In some cases, the test shows the area in the brain where the seizures start. The brain may appear normal after a seizure or between seizures. Wear an EEG recorder for days or weeks as you go about your everyday life. Stay in a special hospital where brain activity can be recorded while video cameras capture what happens to you during the seizure. This is called video EEG. Head CT or MRI scan is often done to find the cause and location of the problem in the brain. Treatment for epilepsy includes taking medicines, lifestyle changes, and sometimes surgery. If epilepsy is due to a tumor, abnormal blood vessels, or bleeding in the brain, surgery to treat these disorders may make the seizures stop. These drugs are taken by mouth. Which type you are prescribed depends on the type of seizures you have. Your dosage may need to be changed from time to time. You may need regular blood tests to check for side effects. Always take your medicine on time and as directed. Missing a dose can cause you to have a seizure. DO NOT stop taking or change medicines on your own. Talk to your doctor first. Many epilepsy medicines cause birth defects. Women who plan to become pregnant should tell their doctor in advance in order to adjust medicines. Many epilepsy drugs may affect the health of your bones. Talk to your doctor about whether you need vitamins and other supplements. Remove the abnormal brain cells causing the seizures. 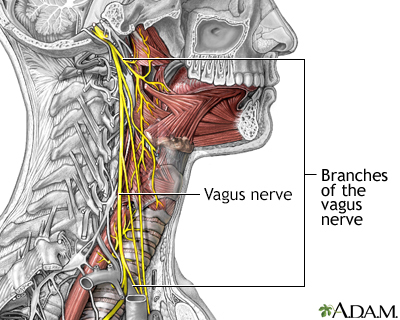 Place a vagal nerve stimulator (VNS). This device is similar to a heart pacemaker. It can help reduce the number of seizures. Some children are placed on a special diet to help prevent seizures. The most popular one is the ketogenic diet. A diet low in carbohydrates, such as the Atkins diet, may also be helpful in some adults. Be sure to discuss these options with your doctor before trying them. People with epilepsy should wear medical alert jewelry so that prompt treatment can be obtained if a seizure occurs. People with poorly controlled epilepsy should not drive. Check your state's law about which people with a history of seizures are allowed to drive. DO NOT use machinery or do activities that can cause loss of awareness, such as climbing to high places, biking, and swimming alone. The stress of having epilepsy or being a caretaker of someone with epilepsy can often be helped by joining a support group. In these groups, members share common experiences and problems. Some people with epilepsy may be able to reduce or even stop their anti-seizure medicines after having no seizures for several years. Certain types of childhood epilepsy go away or improve with age, usually in the late teens or 20s. For many people, epilepsy is a lifelong condition. In these cases, anti-seizure drugs need to be continued. There is a very low risk for sudden death with epilepsy. There is no known way to prevent epilepsy. Proper diet and sleep, and staying away from alcohol and illegal drugs may decrease the likelihood of triggering seizures in people with epilepsy. Reduce the risk for head injury by wearing a helmet during risky activities. This can lessen the likelihood of a brain injury that leads to seizures and epilepsy. Morris GL 3rd, Gloss D, Buchhalter J, Mack KJ, Nickels K, Harden C. Evidence-based guideline update: vagus nerve stimulation for the treatment of epilepsy: report of the Guideline Development Subcommittee of the American Academy of Neurology. Neurology. 2013;81(16):1453-1459. PMID: 23986299 www.ncbi.nlm.nih.gov/pubmed/23986299. Wiebe S. The epilepsies. In: Goldman L, Schafer AI, eds. Goldman-Cecil Medicine. 25th ed. Philadelphia, PA: Elsevier Saunders; 2016:chap 403.